does anyone else have an itchy rash? I’ve been on the diet for a month now and my rash is driving me INSANE. I wake up during the night and find it impossible to concentrate during the day. I was putting coconut oil on it before and i’ve just switched to calamine lotion as of last night. I am also going to slow my antifungals, but I think this could also be a reaction to oat bran. any rash remedies? also, I assume stimulants (add meds) and depressants (non benzo sleeping pills) are bad for the diet because of their effect on adrenals. I’ve stopped taking stimulants but I take a sleeping pill about 2x a week mostly because of this rash. does anyone have any insight on the effects of these drugs? Ah…I AM SO SORRY!!!! I FEEL YOUR PAIN!!! Yes, I have a rash too right now. Before, my skin broke out into these crazy blistered bumps that were horrible and scabbed over and I was in absolute torture!! That’s what made me go to the Dr.’s and they gave me Prednizone(?). It helped take the rash away, but it just came back after I was off the medication. I asked for another refill! Aiyiyi, that wasn’t a good idea. Anyways, my skin is what led me to this site (really God did). It’s been getting a little better, but still itches. When I found this site, I did “their” diet (pure torture) for the first five days. Finally I couldn’t take it and thought I’d try Rice Milk, with Brown Rice Cereal. I ate it for breakfast twice. The next day my chest and neck broke out CRAZY!!! SUPER ITCHY!! My lower back, my legs, hips, too. Ah…so back to veggies!! If you’re not doing the diet listed in this forum, I would totally give it a try and be super strict. I think it’s helping. My chest breakout and neck is finally starting to clear after like 3 weeks!!! It’s still there, just not as bright and bad. I am so very sorry! I will be keeping you in my prayers! When I went to the Dr.’s I just cried! I told them I was dying and I MUST HAVE AN ANSWER! I told him that like 3 times in a row just so he would know I was really serious!! I couldn’t sleep or anything for weeks! Just tortured!! Ah…….hang in there!! Ah…I just feel so bad for you!!! I have been putting on Coconut oil too. I think that helps! Oh yeah, I’ve been taking a hot bath with 2 cups Epsom salt, and 1 cup Baking Soda, 10-15 min. a day. Maybe it helps? I feel better, but can’t say it will take your itching away, cause I’m still itching too, just not as bad anymore. I think it’s more food related. Oh one more thing! The Molybdenum stuff!! Are you taking that? I REALLY think that is helping me a lot!!! Almost forgot about that! Hope you’re taking that stuff! Anyways, you are in my thoughts and prayers! Faith – my rash was what finally led me to this site as well. I have it on my chest, back, and stomach and it drives me NUTS. It’s comforting to know someone else is struggling with this. I’m taking molybdenum as of last week and I’ve been on the strict diet with no cheats except a little tomato and overdoing the coconut bread. I’ll try the baking soda as well. I’m going to go stock up on anti dandruff shampoo (selsun blue) antifungal cream and calamine lotion – hopefully this will help. Thank you! if anyone else has had this experience please share! ive got this rash on both my obliques and every summer it gets worse if i get a tan. its slightly itchy and the skin is very dry and almost patchy around it. ive been putting bentonite clay on it twice a week. it seems to be slowly going away, but have had it for about five years now and just cannot get it to go away. have had three or four doctors look at it i’d like to have a dermatoligist look at it but here is what i always get from them “it almost looks like it could be psoriasis but i have no idea what that is” every single one has said that. There is also the possibility you have parasites. I have parasites and have had non-stop ringworm for a year or longer. Since starting the stuff my naturopath gave me, it has all gone away (rather quickly). I also experienced parasite die-off symptoms over the weekend. Thanks for all the advice. I’m going to try the baths starting tonight, and the calamine lotion has decreased the itching already! thank god!! I have also been scrubbing (with hands) selsun blue extra strength on my rash and washing with very hot water. i think this is helping too. raster, did your rash look like a ringworm rash? mine does not. However I’m going to the doctor today to hopefully get another parasite test. I have a scaly rash that almost looks like a burn with a ton of dandruff. The surface of the skin had a smoother feel to it. It affected the sides of my hair, and various places on the top of my head. It almost completely went away with the diet and then it flaired up and got worse. I am taking zypan, zymex II, and some homeopathics to kill the parasites and heal my skin. If you do have parasites, the only way to get over it is to kill them within the body and then the outside of the body will be healed. I’ve had it for about 10 years and it has been better and worse. I’ve taken many shampoos for it (selson blue, some vitamin shoppe anti-dandruff shampoo, tea tree oil shampoo, antifungals, etc) and nothing worked better than the stuff I am taking now. and there are many more pictures of course. 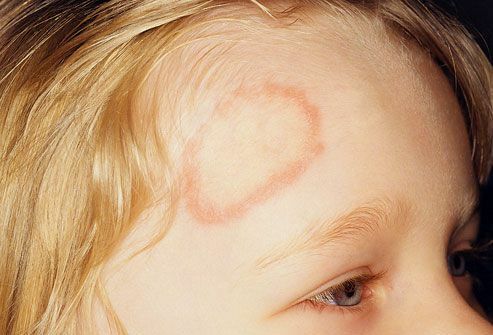 Ringworm can occur in other places on the body. The topic ‘itchy rash’ is closed to new replies.